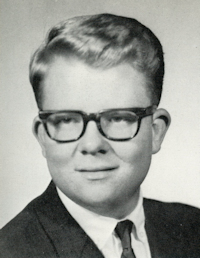 Obituary – Williams, Ray Alan « Perry High School Alumni Association, Inc.
﻿Band 63-67, Jr. Play 65-66, Swing Band 63-64, Band Vice-Pres. 66-67, Band Prop. Mgr. 65-66. Ray Alan Williams, 57, of Stillwater, died Friday, June 30, 2006 in Stillwater. Services will be at First Christian Church in Perry, on Monday, July 3 at 1 p.m., under the direction of Pastor Martin Foster. Born April 18, 1949 to Lester F. and Helen Donaldson Williams in Stillwater, he married Jackie Williams on Dec. 11, 1970 in Perry. He was self-employed. He was predeceased by: his mother; and brother, Monte Williams. Survivors include: his wife; father; son Josh and his wife, Val-Ann Williams; son Zack and his wife, Blair Williams, and sister Susan Williams Ellis and her husband, Mark. Memorials can be sent to Judith Karman Hospice.